over monoids and will give a characterization of monoids by this property of their right (Rees factor) acts. ness which are used here. 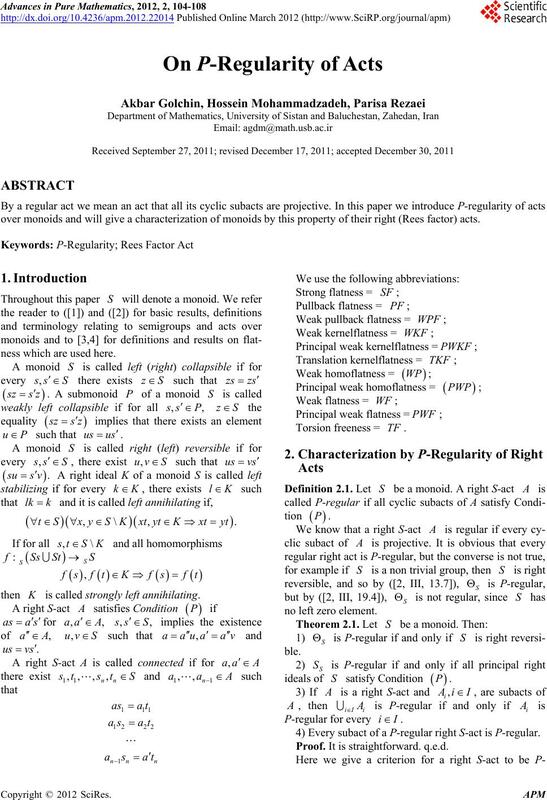 4) Every subact of a P-regular right S-act is P-regular. Proof. It is straightforward. q.e.d. III, 13.4]), we are done. and this is true by ([2, III, 13.4]) . q.e.d. all right S-acts are P-regular. 1) All right S-acts are P-regular. 2) All finitely generated right S-acts are P-regular. 3) All cyclic right S-acts are P-regular. 4) All monocyclic right S-acts are P-regular. 5) All right Rees factor S-acts are P-regular. 6) S is a group or a group with a zero adjoined. a group or a group with a zero adjoin ed. group or a group with a zero adjoined. acts are P-regular as required. q.e.d. 4) All SF right S-acts are P-regular. 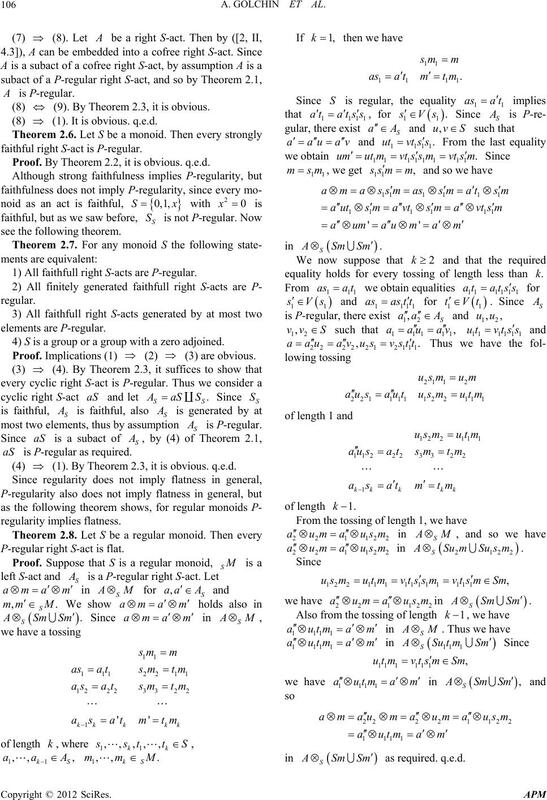 5) All SF finitely generated right S-acts are P-regular. 6) All SF cyclic right S-acts are P-regular. 7) All projective right S-acts are P-regular. 9) All projective cyclic right S-acts are P-regular. 10) All projective generators in Act-S are P-regular. 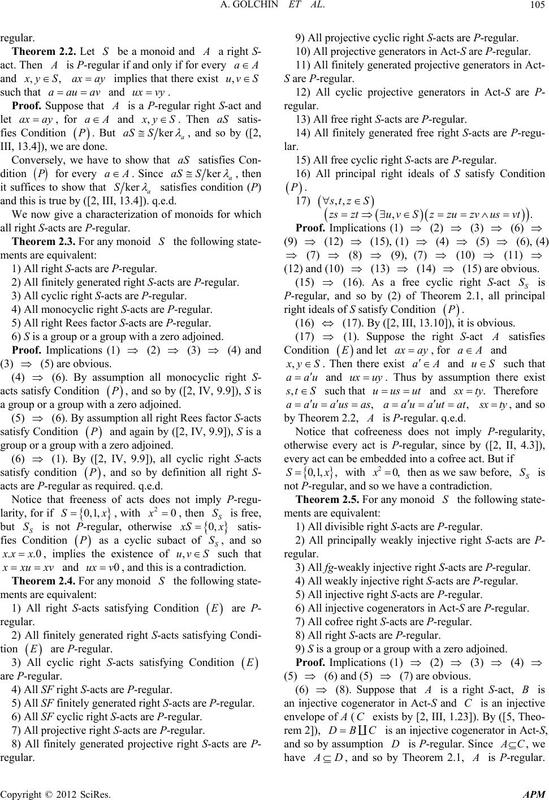 13) All free right S-acts are P-regular. 15) All free cyclic right S-acts are P-regular. (12) and (10) (13)  (14) (15) are obvious. right ideals of S satisfy Condition . 1) All divisible right S-acts are P-regular. 3) All fg-weakly injective right S-acts are P-regular. 4) All weakly injective right S-acts are P-regular. 5) All injective right S-acts are P-regular. 6) All injective cogenerators in Act-S are P-regular. 7) All cofree right S-acts are P-regular. 8) All right S-acts are P-regular. 9) S is a group or a group with a zero adjoined. (5) (6) and (5) (7) are obvious. (8) (9). By Theorem 2.3, it is obvious. (8) (1). It is obvious. q .e.d. faithful right S-act is P-regular. Proof. By Theorem 2.2, it is obvious. q.e.d. 1) All faithfull right S-acts are P-regular. 4) S is a group or a group with a zero adjoined. Proof. Implications (1) (2)  (3) are obvious. (4) (1). By Theorem 2.3, it is obvious. q.e.d. P-regular right S-act is flat. in  as required. q.e.d. P- regularity of right Rees factor acts. Now let see the following theorem. is P-regula r . q.e. d.
2t Rees factor S-acts are P-regular. 3) All right Rees factor S-acts are P-regular. 4) All right Rees factor S-acts are P-regular. mees factor S-acts are P-regular. 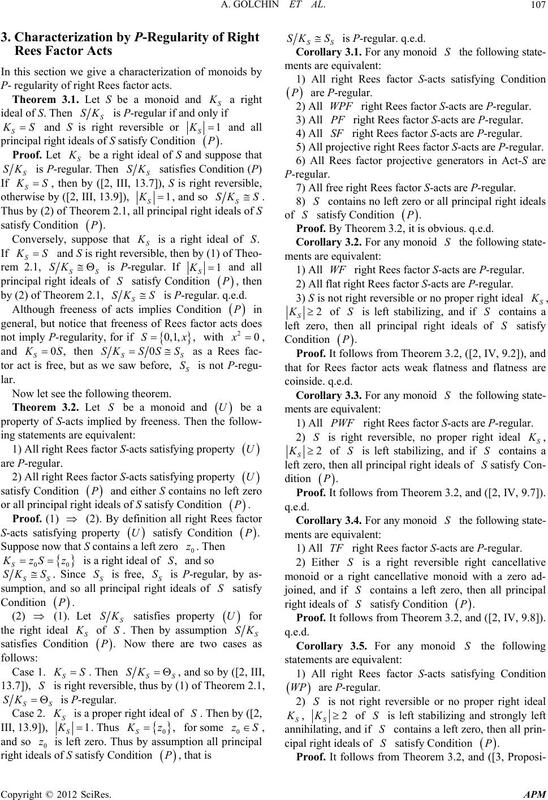 2) All fight Rees factor S-acts are P-regular. mRees factor S-acts are P-regular. Proo fof. It llows from Theorem 3.2, and ([2, IV, 9.7]). mes factor S-acts are P-regular. Proof. 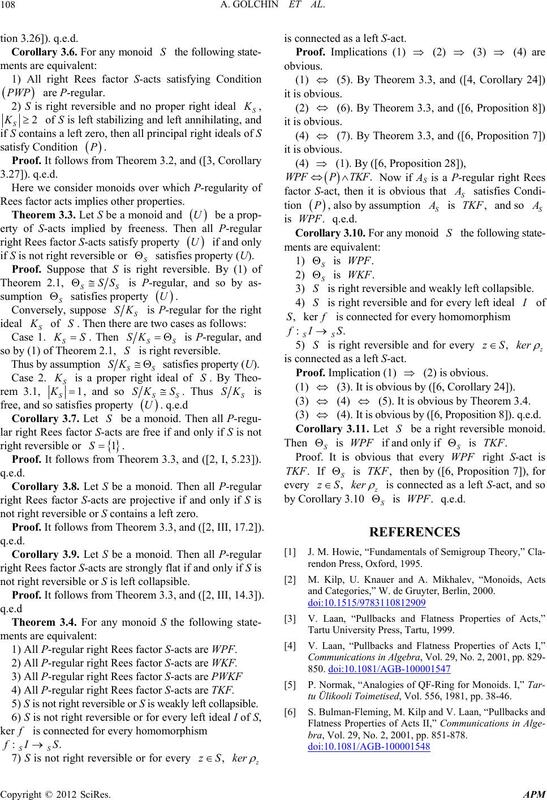 It folls from Theorem 3.2, ad own([2, IV, 9.8]). connected as a left S-act. 1) All right Rees vious. ees factor acts implies other properties. S is right rso by (1) ofm 2.1, eversible. from Teorem 3.3, and ([2, I, 5.23]). mt Rees factor S-acts are WPF. not right reversible or S contains a left zero. not right reversible or S is left collapsible. Proof. It follows from Theorem 3. 3, and.3]). 2) All P-regular right Rees factor S-acts are WKF. 4) All P-regular right Rees factor S-acts are TKF. 5) S is not right reversible or S is weakly left collapsible. S ht revble and weakly left collapsible. is ne (2) is obvious. concted as a left S-act. (3). It is obvioby ([6, Corollary us 24]). (5). It is obvious by Theorem 3.4. (4). I o bvious by ([6, Proposition 8]). q.e.dt is. ThCorory 3.11. Let S be a right reversible monoid. M. Kilp, U. Knauer and A.
and Categories,” W. de Gruyter, Berlin, 2000. Tartu University Press, Tartu, 1999.
tu Ülikooli Toimetised, Vol. 556, 1981, pp. 38-46.
bra, Vol. 29, No. 2, 2001, pp. 851-878.